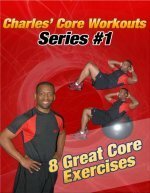 You can use all different types of tools to create some of the best core exercises for women and men. Gliding workout discs are just another tool that you can use in your core workouts. If you've never use them before, first try mountain climbers or 2 leg knee ins. If both of those exercises feel easy, then try the advanced exercise below. When you only use one leg, that leg will work really hard to stabilize your entire body weight. 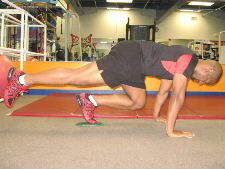 Below are pictures of 1 leg knee-ins from a plank position using gliding workout discs. Starting Position: Get into the plank position with your hands on the floor. Then, place one foot on a gliding disc and slightly lift the other leg off the floor. Form: While keeping your core muscles engaged, slide the disc forward as you tuck your knee into your chest. Hold for a brief second and then slowly extend your leg back to the starting position. Personal Trainer Tips: This is a tough exercise, so try 3-5 reps on each leg in the beginning and build up over time to 10-15 repetitions on each leg. Make sure that you keep your hands directly underneath your shoulders, and keep your core muscles engaged throughout. Push ups and regular 1 leg planks can help to build up your upper body and core strength so that you can perform this exercise. This is an advanced exercise, so you should only try it if you've been working on building up your core strength. When you start adding challenging exercises into your routine, it is important to listen to your body, and if you cannot keep good form you should use other exercises to build up your overall core strength.